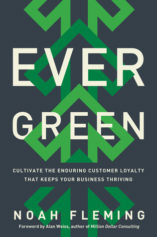 Evergreen by Noah Fleming boils down what most successful companies do right in just three c’s. This book compares businesses to evergreen trees and a bucket full of holes. Would you keep adding water or try adding water more quickly? Fleming identifies three key ingredients to building a strong sustainable business that attracts and retains loyal profitable customers. Character gives a business its footing. More than just its story, character is the foundation for everything it does from decision-making to how it treats customers. It doesn’t matter what you do but why you do it. Character is also the platform on which sustainable communities can be built. Community enables you to build a bond. People are drawn to others that share common beliefs, values and interests. With a community of customers you should harness the power within the community to inspire sustainable growth instead of focusing purely on new customer acquisition. Content delivers value – this includes the entire experience, moving beyond product and service. Instead of what you do, focus on how you do it. What makes your experience better and different than how others do it. Consider how you could change the experience or let customers personalize their experience to add even more value. Evergreen cites numerous examples and tells stories to clearly demonstrate how other companies actually implement these concepts, making it very easy to understand. Fleming highlights what the best loyalty programs do well and what makes them most effective. In contrast, it also highlights the upside to firing customers. This book is likely to spark some new ideas you can apply to your own business and build your own evergreen business.